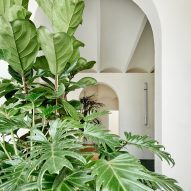 Partitions punctuated with arched openings divide the living spaces inside this Barcelona apartment, which has been overhauled by architecture studio PMAA. 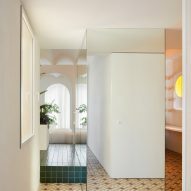 Situated on the top floor of a residential building in Barcelona's Raval neighbourhood, Penthouse has been updated by locally-based PMAA to feature fresh white surfaces and a sequence of vaulted partitions. 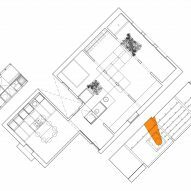 They help loosely arrange the 99-square-metre home into two zones – a living area, which sits towards the front of the floor plan, and a "wet" area that lies at the rear, accommodating the bathroom and kitchen. 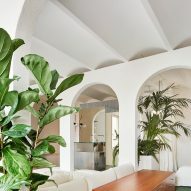 The living area is dominated by a huge sectional sofa that fits around the columns of the partition walls. 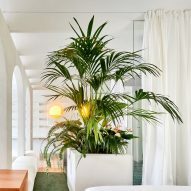 Sea green carpet has also been applied to the floor, complementing planters that are stuffed with tropical foliage. 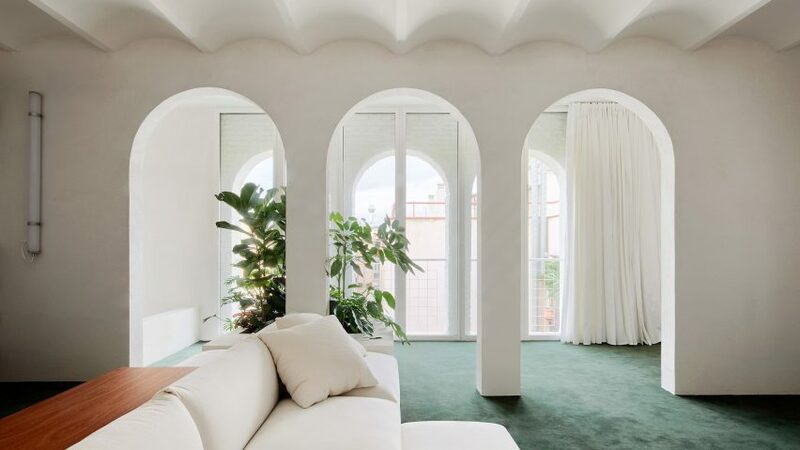 This room overlooks the street through arched windows in the building's original facade, which, along with the apartment's Catalan ceiling vaults, inspired the design of the new partition walls. 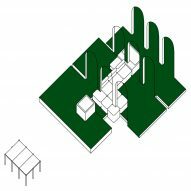 "The geometrical repetition of the consecutive load-bearing walls results in a unique space that preserves its originality," explained the studio. Stepped flooring leads up to the bathroom, which has a silver metal sink basin and a boxy mirrored volume that contains the toilet. A tall pane of glass that doubles as a splashback for the shower separates this space from the bedroom – a white curtain can be drawn across to provide privacy when required. 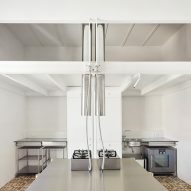 Although decor has largely been kept to a minimum, the studio decided to preserve existing patterned tiles in the kitchen, which is finished with steel storage elements and dining table. 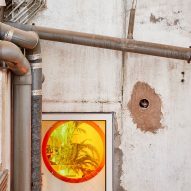 A porthole has also been punctuated in one of the apartment's peripheral walls and covered with coloured acrylic to emit a faint orange glow. "It creates a distorted version of external reality, and an unreal light inside that's reminiscent of an autumn afternoon," the studio explained to Dezeen. 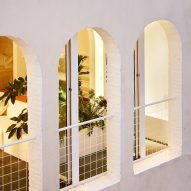 PMAA is one of several studios to implement arches into its projects –New York-based Raad Studio used an arched wall to unite two formerly separate properties in Lower Manhattan, forming one huge apartment. 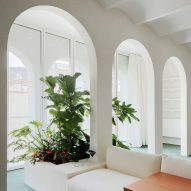 Israeli practice Pitsou Kedem also added vaulted doorways to a Jaffa apartment, mimicking its domed ceiling.